Make videos and screenshots of your gameplay with Game DVR, and then edit and share your best moments with friends. To create your perfect gaming montage, you can edit clips from your Xbox One and your PC in your favorite video editor. 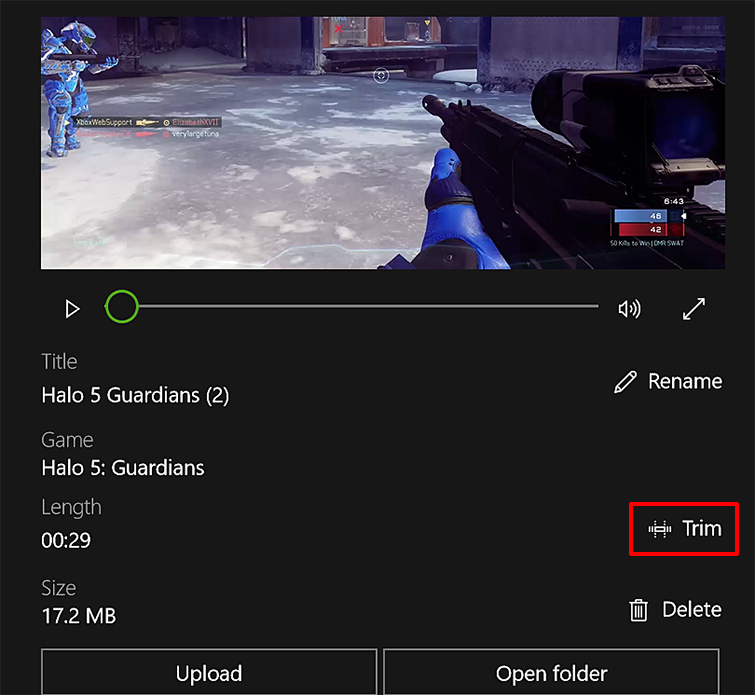 If all you need is to trim the beginning or end of a clip to focus on the best moment, use the Trim tool in the Xbox app. Then, share your edited clips to your favorite social media, including to Xbox Live through the Xbox app. Open the Xbox app, and select Game DVR. Note Editing in the Xbox app is restricted to Trim at this time, but it’s perfect for taking just a little off the front and back to focus on one moment. Select the clip you want to edit. You can choose from On this PC and clips you Shared from Xbox One. If you chose a clip from Shared that you haven’t downloaded yet, select Download. To shorten the clip, select Trim. Move the left bar to trim length off the beginning, and the right bar to trim the end of the recording. When you’re satisfied, select Save copy to finish. Game clips are originally named with the game title, the date, and the time so that you can quickly find it, but you can change the name before you share your clip with the world. Game clips (under 30 minutes long) and screenshots of popular PC games and any game available through Microsoft Store can be shared to Xbox Live. They aren’t automatically uploaded from Windows 10. In the Xbox app, select Game DVR. Select the game clip or screenshot you want to share. Note Xbox checks uploaded content for violations of the Xbox Live Code of Conduct. There may be a delay before your clip or screenshot is visible to anyone else. To share your captures on other social networks or by email, you’ll find the files in the Captures folder, which by default is in your videos folder. 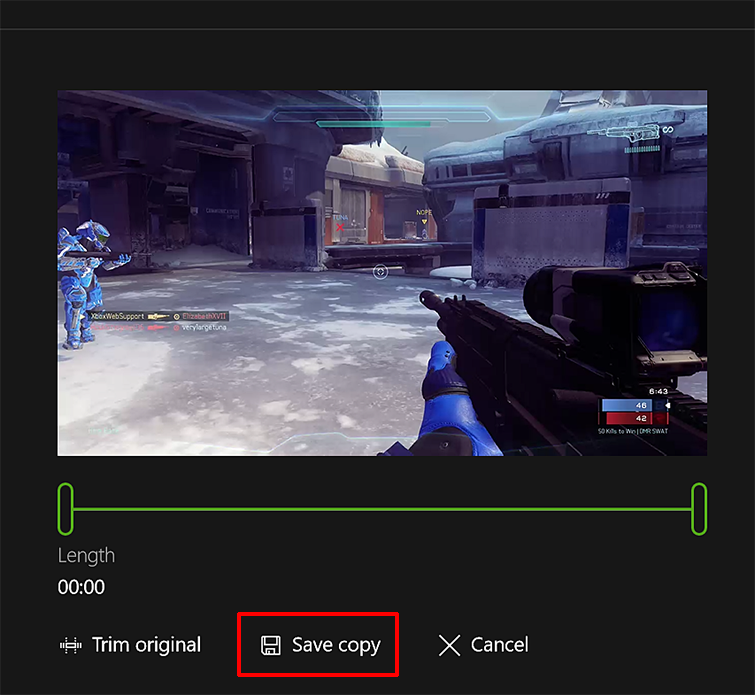 From the Xbox app, select Open folder under the clip you want to share, and it will open File Explorer where that video is saved. Then, use the website or app for the social media network to share the clip or screenshot. Access your privacy & online safety settings. Next to See your game clips (Xbox One only), select who you want to share with, whether it’s Everybody or just your Friends, or you can choose to completely Block others from seeing your game clips. Would you like to contact Support regarding the "Edit and share game clips with Game DVR in the Xbox app on Windows 10" issue you were reading about or a different issue?